A vehicle similar to the Cincinnati Streetcar is making the journey across Europe from Zaragoza, Spain to Wednesbury Depot in England. Trams Today posted about the much-anticipated Urbos 3, which was manufactured by CAF, the same company creating streetcars for the Queen City. The only difference is that instead of coming from Spain, Cincinnati’s streetcars will be built by CAF in Elmira, New York in compliance with the Federal Transit Administration’s “Buy America” incentive. The pictured Urbos 3 will ride the rails through the West Midlands, one of the most heavily urbanized counties of the United Kingdom. “The CAF built trams should then become a regular sight on the tramway. 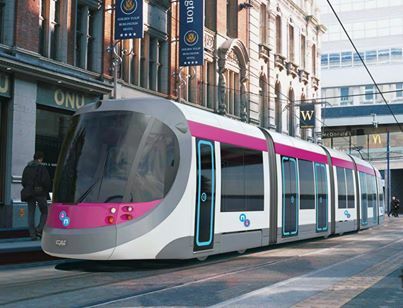 It is still the intention that they will enter passenger service later this year, ahead of the opneing of the extenstion of the tramway through the streets of Birmingham to serve New Street station. This entry was posted in Connect, Streetcars Around The World and tagged American Streetcars, CAF, Cincinnati, International Streetcars, Light Rail, Streetcar, tram, Vehicle, Zaragoza.